Retinol is basically a type of Retinoid found in vitamin A which acts as an exfoliant to help you get rid of the damaged skin cells. It isn’t exactly same as exfoliating but it does encourage cell turnover. It’s proven to soften fine lines and acne spots too. With so many doctors and beauty companies on a hunt for the next big anti-aging/anti-acne product, why do Retin-A and retinol still have so much appeal? The answer, many dermatologists say, is simple: They work. And it was also proven in a viral Reddit thread about a woman’s skin transformation that she credits retinol for. 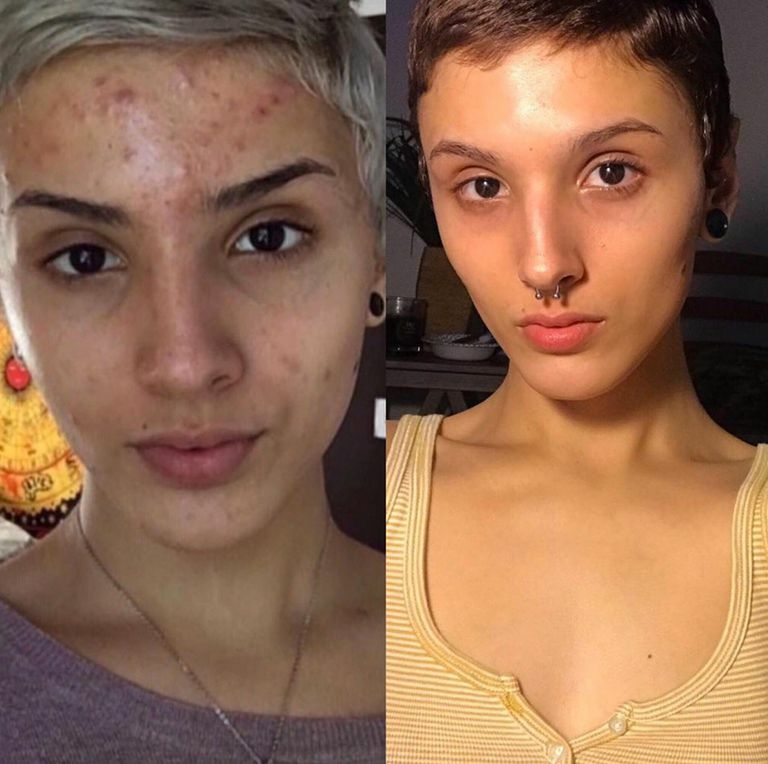 Reddit user Egotr4p posted this photo titled, “Hard work and retinol rlly make a difference,”. She shared that she used a prescription retinol called Tretinoin 0.025%. “I did not go to a derm, although I had access to RX retinol,” she wrote in her comments. And that’s not it. Retinol has strong science to support its effectiveness too. A 2007 study found that topical 0.4% retinol improved fine wrinkles after four weeks of treatment. A 2000 study conducted by Varani J and team found that topical application of 1% retinol in 53 individuals (80 years or above) reduced the levels of MMP (matrix metalloproteinases) and increased fibroblast growth and collagen synthesis in 7 days. So, if retinol is so effective and well studied, why isn’t everyone using it? “It’s actually one of the most misunderstood drugs,” says Dr. Kenneth Beer (a dermatologist in Palm Beach, Florida) in an interview with The NY Times. “You need to take a few weeks to ramp up very slowly, but people will glob it on every night from the start and then call their doctor in a panic that their skin is red and peeling,” Dr. Beer said. Best to start at the age of 25. You can also start using it at a young age, say early 20s. After all, Prevention is a lot easier than correction. What strength of retinol is suitable for your skin? Research has shown that concentrations as low as 0.01% retinol are effective for improving skin’s healthy appearance. Not everyone needs a high-strength retinol—even someone with sensitized skin can get great results from lower strengths. To determine your tolerance, experiment with different strengths and application methods, and see how your skin responds—beginning with a lower concentration. For sensitive skin : 0.01% is considered low strength and can be used by people with sensitive skin. Try Paula’s Choice Skin Balancing Super Antioxidant Concentrate Serum, $36. For normal to combination skin : People who have normal skin and are dealing with stubborn skincare problems can go for moderate strength i.e. 0.04 – 0.1% . Apply it either as a nightly step or 2–3 times per week, depending on your skin’s response. Try Paula’s Choice Resist Intensive Wrinkle-Repair Retinol Serum, $42. For darker/thicker/tougher skin : Go for retinol 0.5 – 1% which is considered high strength – to deal with deep wrinkles, loss of firmness and other concerns, including stubborn pores. Try SkinCeuticals Retinol 1.0 Maximum Strength Refining Night Cream, $82. Big Tip: If you notice signs of irritation, reduce the frequency of use until you find the correct balance for your skin. • Start with a pea-sized amount – with a lighter dose of around 0.05% on alternate days , to treat your entire face at least 10 minutes after cleansing your face (avoid applying it to your eyes and mouth). Follow up with a moisturizer to buffer any irritation. You can start using it nightly, once your skin is accustomed. • If you have extremely dry skin, try incorporating ceramides into your routine to maintain a healthy moisture balance, and and prevent the potentially drying effect of retinol. • Make a habit of applying sunscreen daily as retinol can make your skin sensitive to sunlight. • Retinoids break down in sunlight so incorporate it into your evening regimen. Make sure you keep the rest of your skincare simple to avoid overloading the skin with active-ingredients. If you wish to apply it during daytime for some reason, make sure you wear a broad-spectrum (SPF 30+ ) sunscreen as the last step in your daytime skincare routine to protect the new healthy skin that is being created. • If any irritation persists after adding vitamin A (Retinol) to your skincare regimen, know that it’s all “part of the process” and your skin will eventually begin to tolerate the ingredient once it is accustomed, typically takes 2-4 weeks. If it doesn’t go away after a short period of time, or if you have swelling or a rash, wash it off right away, and call your physician for advice. • If you’re planning to get pregnant or are already expecting. • At least 2 days before/after getting a wax. How long does it take retinol to work? People will experience results differently but usually it takes about an average of 12 weeks for retinol to produce some noticeable changes in the skin and it mostly depends on the strength of retinol you are using.